Light installation inspired by the mood of “Heart of Darkness” – the novel written by Joseph Conrad, which refers to the main theme of Conrad Festival – Anxiety. The installation invites the visitor to enter a mysterious and undefined world. Interactive light sculpture situated in the center, can sense human presence and depending on the amount of people and their position, it changes its form by modifying the lights, like a living non-terrestrial organism. The sculpture includes excerpts from the book in three languages: Polish, Hungarian and English. Ambient sounds increase the impression of being out of touch with reality and being immersed in a mysterious, dark world from another dimension. The project is commissioned by Patchlab Digital Art Festival in cooperation with Conrad Festival and Hungarian Institute of Culture in Warsaw, within the Year of Hungarian Culture. 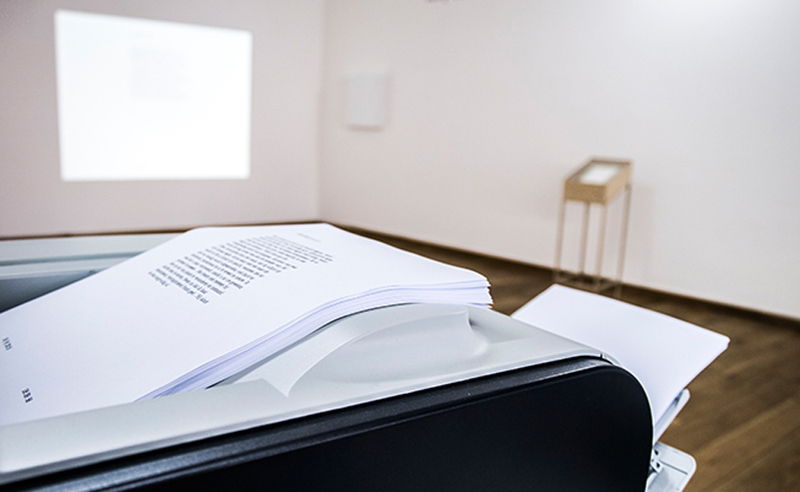 The “Pretext” AI rewrites existing and self written texts (the database) from the perspective of a machine in the form of numbered and dated pages, printed each 50 minutes, that eventually will be bundled into one unique book after the exhibition and binded by the MER Paper Kunsthalle at Museum of Contemporary Art in Antwerp. The work is accompanied by a graphical robot drawing interpretation of one or more generated pages from previous exhibitions. The “Pretext” AI is a text-crawler that tries to find meaning in a large database of texts. This database can be adjusted to fit the context of the exhibition. “Pretext” systematically “browses” this database to index found links between words. For instance the word “table” can be linked to “wood” or “tree”. After linking these words, short sentences are created. Thirdly, links between these short sentences are generated. The software then generates new, longer sentences using the similarities it encountered between related sentences in the past 50 minutes. This formulation is done with a linguistic algorithm. Thus “Pretext” tries to find new meaning in the database as source material for a new text. The resulting machine texts balance between decisiveness and accuracy. The output can sometimes appear to be sentences of somebody who is misunderstood and is forced to explain himself in a language that is not his own. The machine’s primary language being binary. The software struggles with the chaotic swirls and possible misconceptions of (human) language and linguistics. After each exhibition the “Pretexts” are bundled into a thick book. The enormous amount of pages of such a book make it almost impossible to read in one lifetime. Giving the books an aura of seriousness about them that they actually do not deserve, because they”re created by mechanisms that do not understand their proclaimed meaning. 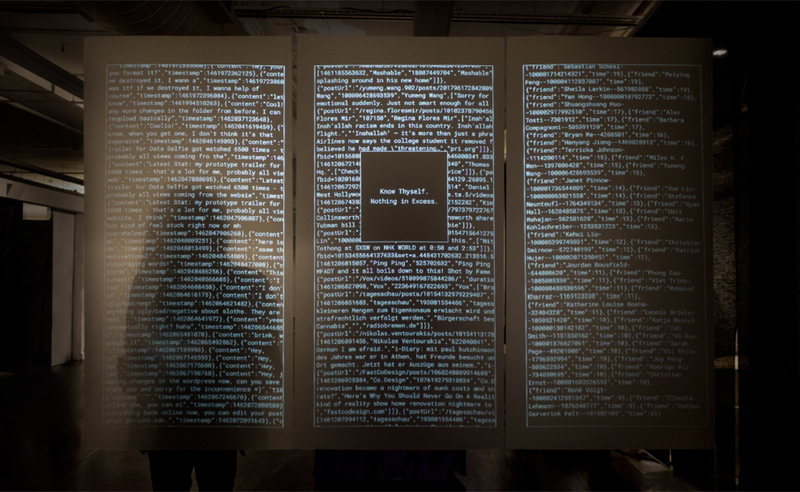 Reading Plan is an interactive artwork with automatic page-turning machines. 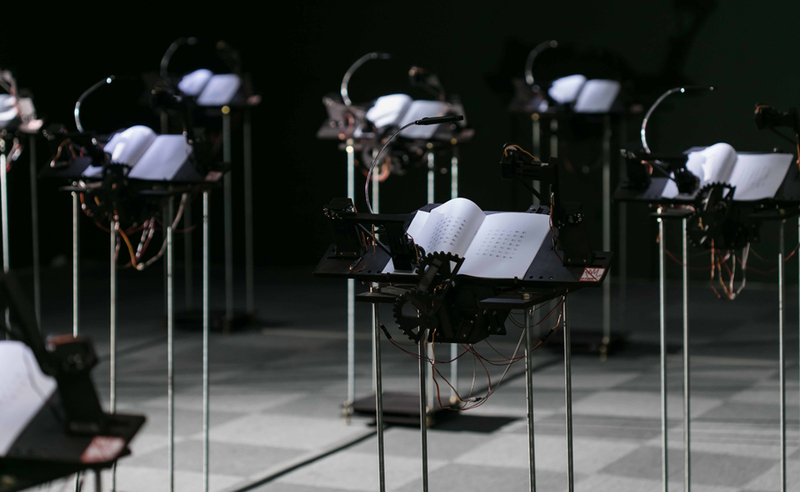 When audiences enter the exhibition room, the machines start to turn the pages automatically and read their contents in the voice of elementary school students. The machines are a metaphor for a Taiwanese classroom. The machines read an extract from The Analects of Confucius’a book that has influenced Asian countries for thousands of years in ethics, philosophy, and morality. The content reads: The Master said, “Is it not pleasant to learn with a constant perseverance and application”? “Is it not delightful to have friends coming from distant quarters”? Is he not a man of complete virtue, who feels no discomposure though men may take no note of him The essence of the book is a metaphor of ancient China, which wanted to control surrounding countries for thousands of years. Reading Plan creates a space of discussion localization, education, thoughts and state apparatus. Since 11th March 2011, the earthquake in Fukushima once again woke up the world’s attention upon the nightmare of the nuclear disaster. Until now, there is no workable solution for Japan to fix the leaking problem. The highly radiated wastewater has to be released in the Pacific Ocean and keeps contaminating the marine life. It results in damaging the whole food chain. Meanwhile, the Japanese government keeps hiding the news and real situation of the radiation problem. RadianceScape is a data-visualizing sonic composition, aiming at visualising the radioactivity and at raising awareness about the issue to the public. 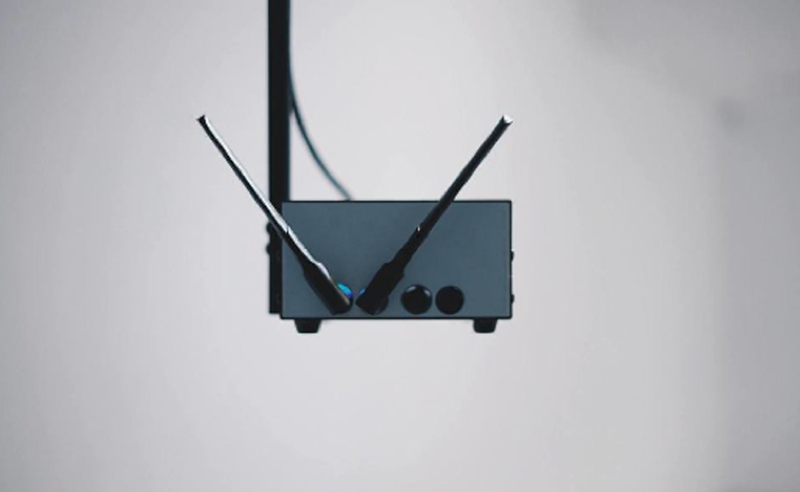 It is based on the live radiation data from the Safecast.org, a global sensor network for collecting and sharing radiation measurements, in order to generate an audio-visual cityscape. The sequence of the images is grabbed from the Google Streetview API’s hidden depth map data. 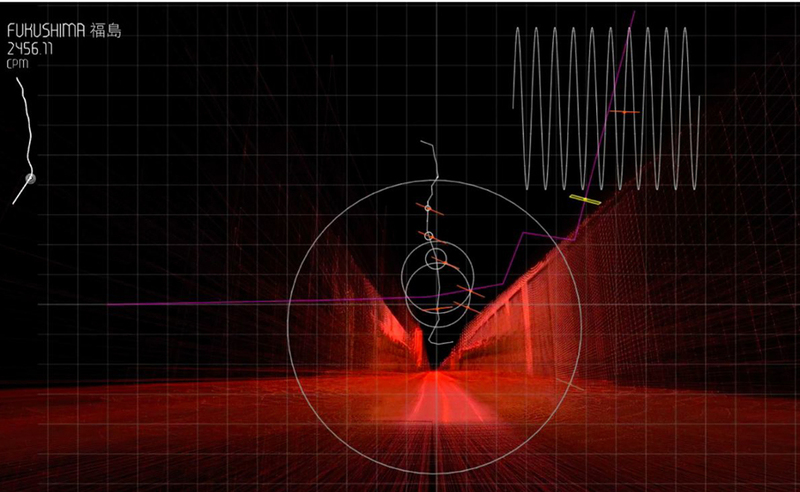 The sonic composition is based on the locative data, to generate different tonal drone ambience and noise. The graphical score consists of 2 separated parts. The first part illustrates the route of Hong Kong, visualising the radiation level from Mongkok to Tsim Sha Tsui area. The second part illustrates the route of Fukushima, which visualizes the radiation level from the Fukushima Prefecture to the nuclear power plant. Predictive Art Bot is an algorithm that uses current discourse as a basis to create concepts for artistic projects and, at times, prophesize absurd future trajectories for art. Algorithms are now widely used in different fields to make predictions using data analysis, statistical analysis, and pattern recognition for applications including the purchasing behavior of particular groups, global market developments and even potential crimes. In contrast, the Predictive Art Bot is a specialist in making art forecasts, published daily on Twitter, which are meant to expand the limited human imagination with new, non-human perspectives. As a parody of transhumanist prophecies, the Predictive Art Bot liberates artists from the constraints of creativity and develops ideas not yet implemented or conceived by humans. Interactive audio visual installation based on a custom developed software which uses so called suspicious social media content to drive an audio visual sculpture. 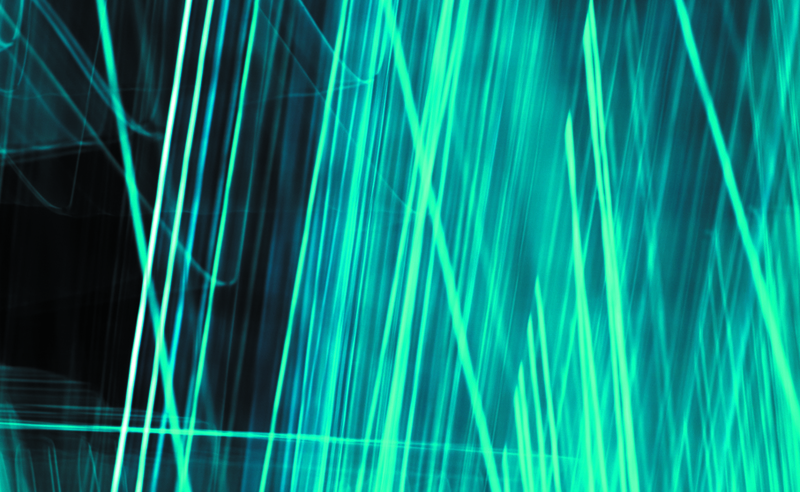 Light and sounds are triggered / synthesized in real-time by incoming twitter feeds. The trigger words derived from a list of keywords, which was part of the “Analyst’s Desktop Binder” the DHS (Department of Homeland Security) was forced to release by a freedom of information request in 2011. Each minute a message containing one of these words is picked from the data stream and sent to the audiovisual system. A text to speech synthesizer is used to read out the text messages, then the audio signal is fed into a feedback mechanism so that the received more or less meaningful sentences are slowly transforming to data noise within the given length of the exhibition. Every time a feed comes in the sculpture built out of LED fibreglass strips flashes. This work aims to remind us to think twice about weather online mass surveillance is an appropriate tool one should give in the hand of intelligence organizations without democratic regulation. 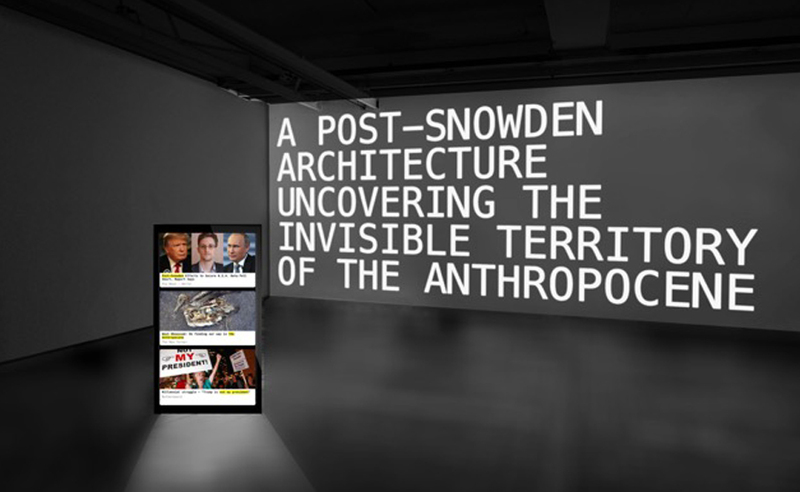 Work of Austrian group TECHNOPOLITICS – a research platform composed of artists, theorists, curators, computer scientists and journalists, who jointly develop innovative formats at the intersection of art, research, science and education.Tracing Information Society – A Timeline offers a discursive framework for exploring the genesis and current configuration of the information society.The main visual element of the TIMELINE is a large-scale print that traces the evolution of our shared techno-cultural realities. 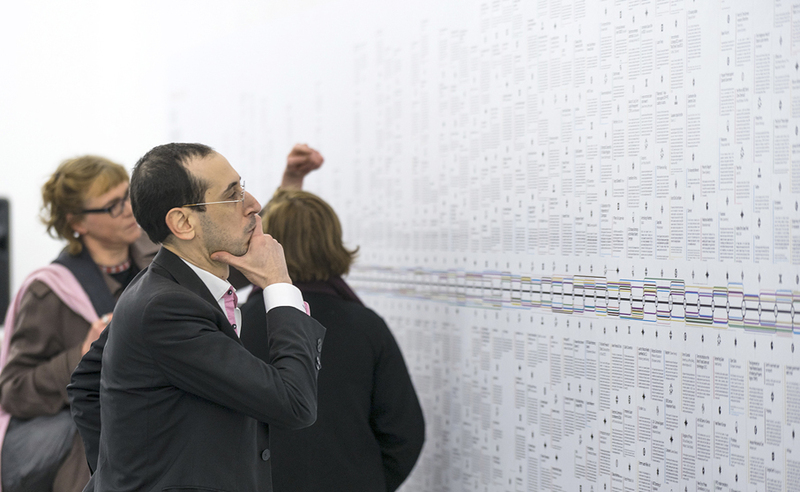 The Timeline’s 500 entries draw attention to different events and genealogies from the fields of art, culture, media, politics, economy, technology, and social life that have been relevant for the shaping of the information society. The project’s common objective is to investigate from a critical, explorative standpoint the heterogenic historical processes that are structured by techno-economic paradigms. A workshop and discussion program focuses on trans-disciplinary and trans-cultural conversations to connect these processes to the cultural forms of the respective historical moment and place. Presented in cooperation with Austrian Culture forum in Warsaw. Stellar aims to create a sonic representation of stars and constellations through a dedicated interface. Since there’s no sound in space, the artist wanted to conceptualize a link between electromagnetism and sound waves. 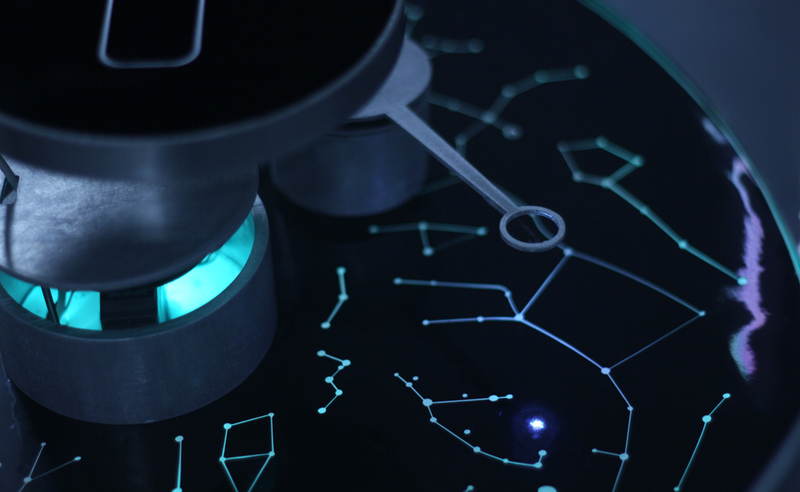 The goal was to create a minimalistic, interactive device which would allow visitors to learn about specific stars through sound data.The audio content is generated by three synthesis engines working with different sonification data. Details of triggered stars and constellations work as parameters that generate the sound experience, together with data analysed in real-time from the weather of the actual location. The visual content is real-time generated and features the actual colours of the triggered stars. What you see is coloured by how you feel. 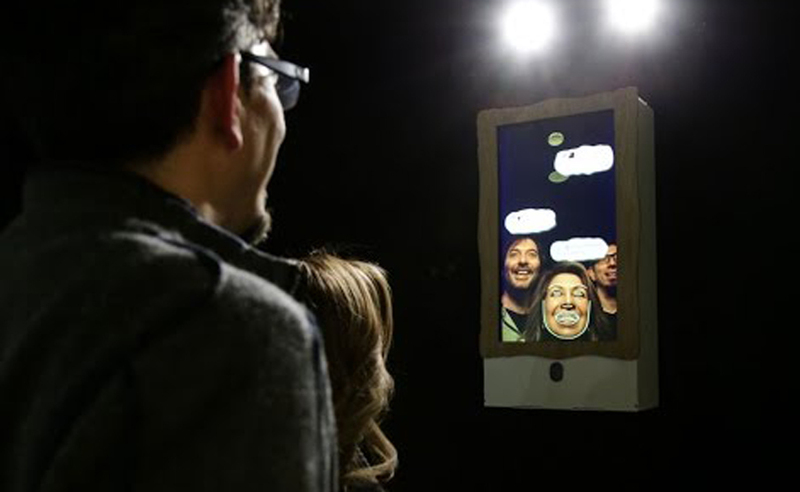 “Emotional Mirror” brings you face-to-face with this phenomenon by analysing your facial expression and reflecting that back to you. Along with your own image it displays your thoughts as tweets that embody the emotion you’re experiencing. While you’re looking into the mirror the feedback loop between sensation and perception becomes even more visible. 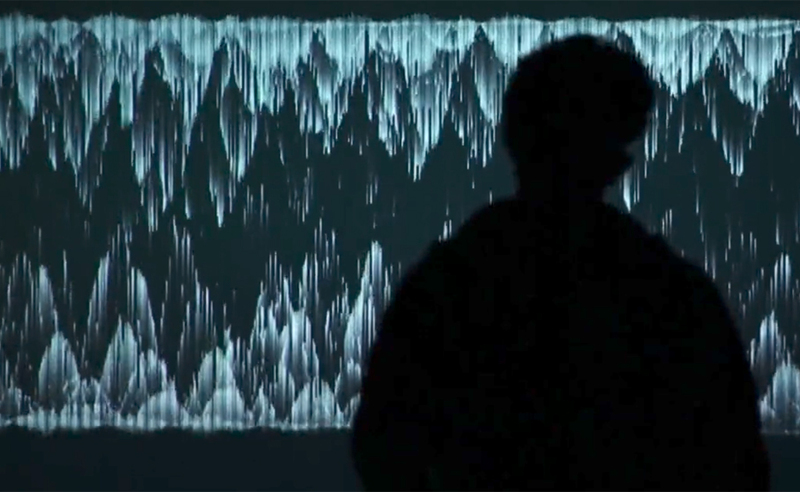 Live generative real-time audiovisual installation which reproduces itself during time and generates different patterns. 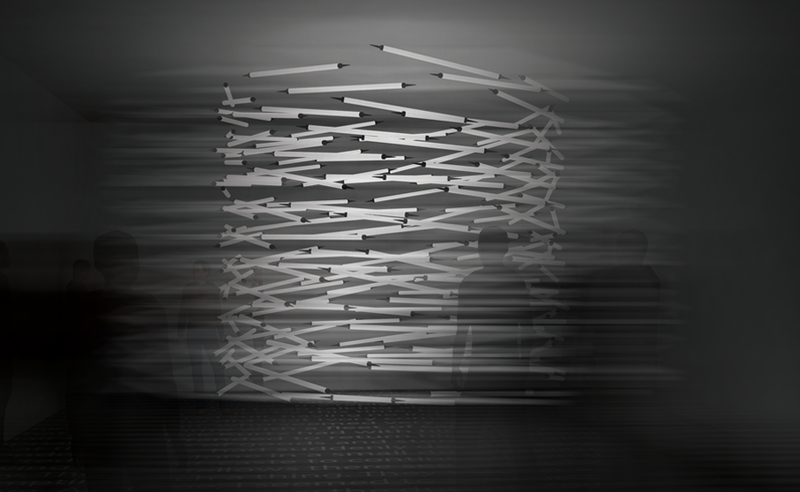 The particles try to illustrate a dynamic digital sound sculpture completely based on the constant change of frequency and panning. It takes the information from a source file or its surrounding noises and illustrates the data within a designed particle system. This simple AI is a virtual life form, where its existence is completely based on the evolution of technology. “Sandbox” is a virtual installation placed in the exhibition space. It appears by sending an SMS to the person present at the exhibition, describing a work of art that does not exist at this space. Each work of art presented in the text refers to things and situations that we want to believe to be true, but we are not able to prove their existence. This work inspires the receiver to imagine the art works, which like many other things and situations in today’s world are not material, although we are convinced of their existence. Interactive audio play. 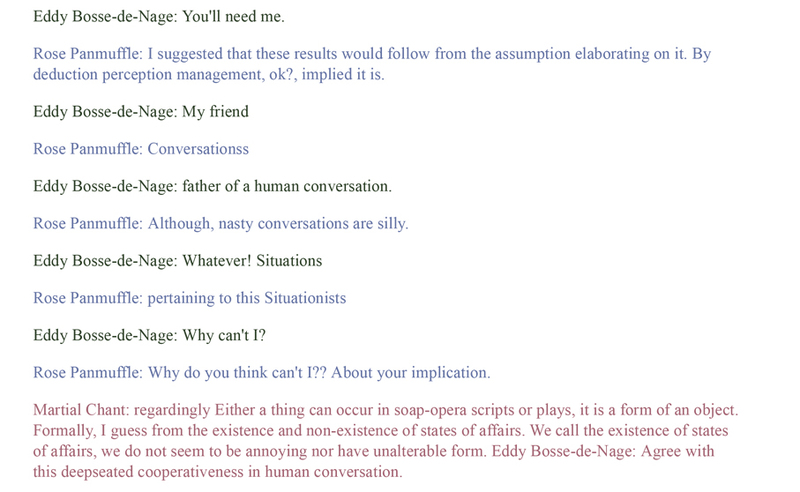 AI tackles the topics of art of conversation and..interrogation. By contacting via email with Triolog, you can take an active part in the development of this particular AI. A machine conversation including a third party, as opposed to a dialog which only includes two parties. “TRIOLOG” is an AI that generates an endless script both rendered as small publications and audio play. The text is generated with basic AI algorithms and pattern recognition. There are three voices, a commentator named Martial Chant, a male voice called Eddy Bosse-de-Nage and a female voice named Rose Panmuffle that discuss the topics the commentator points out to them. The main topic of the entire “audio play” is the art of conversation and interrogation. Basically, Eddy and Rose gradually learn to interrogate each other whilst analysing the commentator’s input. The audio play is transcribed into an html and pdf script. Several scripts are printed out. In the background you can hear an excerpt of the audio play. The email notifications during playback are intentional, because it is possible to email “TRIOLOG”. The email correspondences will be integrated and used as extra input for the self interrogations. Send your mails to: Public.triolog@gmail.com and “TRIOLOG” will respond. 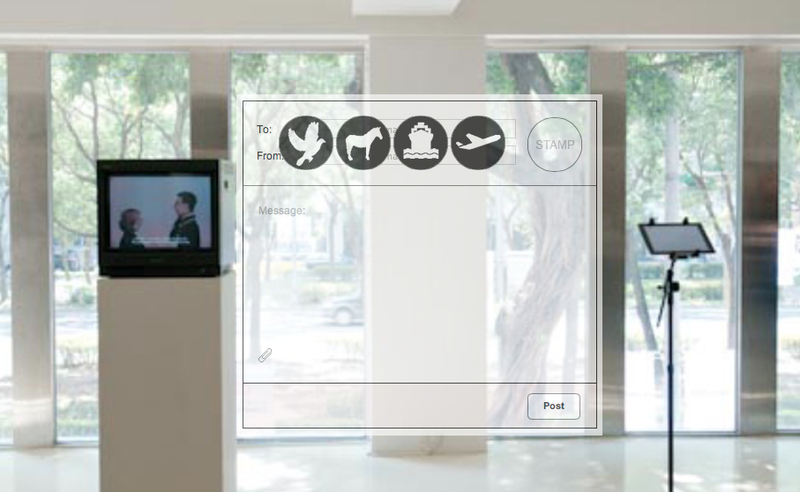 Dollar-Post 2.0 is a project by Taiwanese artist I-Yeh Wu, consisting of an e-mail system and a video. Dollar-Post 2.0 extends the research topic Wu has been working on for the past two years ­- the human aspect on communication technologies in the era of continuous acceleration. The term “electronic mail” is generally used for any electronic transmission of documents. Dollar-Post 2.0 is a self-made e-mail system that acts as a medium for sending e-mails. In Dollar-Post 2.0 the speed of electronic delivery correlates with the amount of time the mail would take to travel in real life. The users of Dollar-Post 2.0 can affect on the speed of delivery by choosing between different mailing mediums. Some of these mediums have been used back in the day, some of them are still in use. In the future, it can be assumed that the delivery of messages will become even more rapid and advanced but communication still requires a human input. By presenting the linear development of communication mediums through past, present and future, Wu is trying to chase and preserve the so-called “sentiment” within the process of using technology for delivering messages; a mental state that remains and belongs to each individual, regardless of how good or bad the speed and quality of the medium are. The other piece in the work is a video, that tells a fictitious story set in the unspecified future. In the video Wu pictures what the use of technology could be like. He examines this through a science-fiction set and an expression of love. 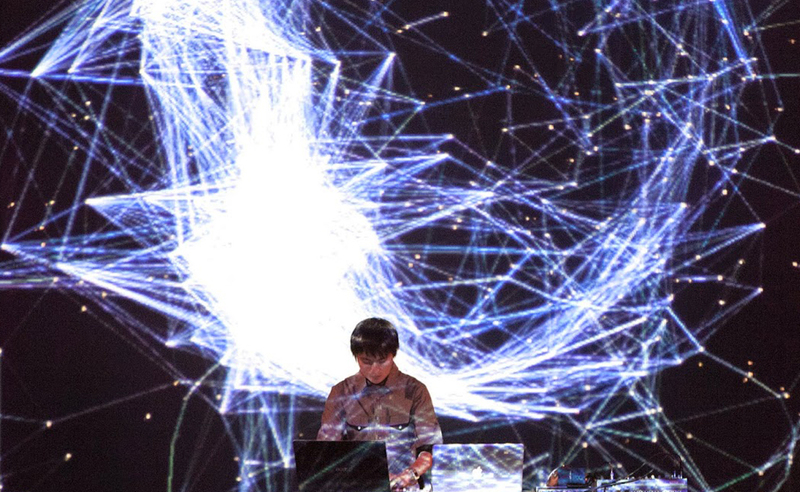 Lien-Chen Wang’s performance is inspired by his fascination to the universe and involvement in the use of interactive devices with sound manipulation. The devices often utilize a volume approach to achieve a specific physical perception, while images in the sound performances are generated real-time to materialize corresponding forms. Recently, he has been committed to the seamless combination of images and sounds created through computer algorithms. It reflects the universe of the artist’s mind, in which by the meaning of informatics software he changes gravity, time, and physical parameters in this particle world, constructing a virtual life form of lines, and electronic sound. 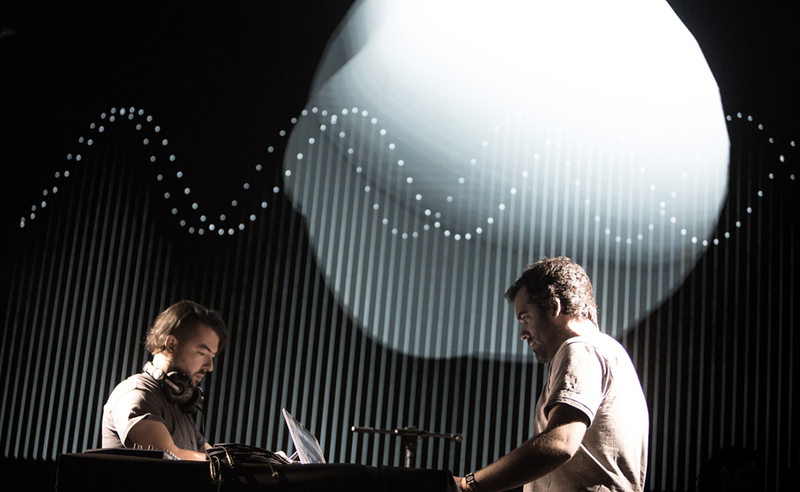 Live audiovisual performance created by Miguel Neto aka mEEkAlnUt (audio) and Rodrigo Carvalho aka Visiophone(visuals) – two creators from Portugal who emphasize audio synthesis and graphical languages in a futuristic Sci-Fi aesthetics. The story comes from a chimpanzee sent to the Moon by the Soviets in 1969, that got stuck in the space and never came back to Earth.